Do you know or can you appreciate what it feels like to be stuck in the middle? 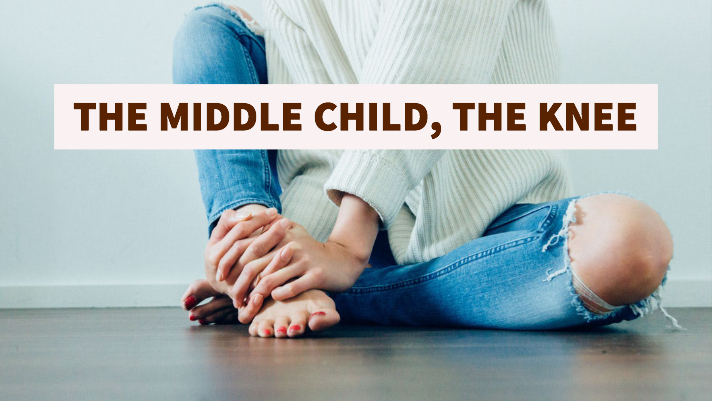 Maybe as a middle child. Or maybe between two people you love, but personally think are a little crazy? This is the knee. A simple sturdy joint, with really one plane of motion, forward/back (for purists, yes, there is some small but important rotation, and some side to side give). This lovely knee joint sits at the end of two long levers (aka the thigh bone and shin bone), so sometimes the knee just needs to complain about the fact that the ankle can’t get it’s 26 joints together or that the glute sitting way above it has taken an extended island vacation and not done any work lately. Not to say there aren’t certain things that happen directly to or because of the knee- a slide tackle in soccer, a strong pivot on a fixed foot, 40 hours a week of elite level gymnastic pounding on it. These can definitely cause some ligamentous, cartilaginous, or soft tissue strain at the knee. These are generally easy to trace to their cause. However for most complaints of knee pain, the treatment ends up being far from it. This is one thing that can go wrong on the hip end of the knee, but sometimes it isn’t a matter of pure strength, but of timing or functional use. You may have one of the strongest glute medius around, but you use it poorly. Possibly you played a sport where you were hamstring or quad dominant, and now you have a pattern of bypassing the glutes and going straight to your favorite hamstrings. This will likely eventually cause you some grief. This is also a solveable problem, but may require a little more conscious training or the help of an movement expert. Now let’s talk about something that isn’t as much of a hot topic, but just as important when we examine insidious onset (without obvious cause) of knee pain; the foot! This conversation could also go on forever and would include footwear, terrain, the flexibility of the ankle and the big toe and the strength and timing of the specific muscles. One of my favorite analogies of the foot is big toe control/strength- would you ever imagine using a hammer without your trusty thumb guiding the direction of that hammer? Nor should you run without a strong and smart acting big toe- how we deal with the ground when we meet it has a lot to do with the small but mighty muscles of the foot! Other foot factors we need to talk about are: the amount of flexibility the ankle has- especially in this case, the amount that you can pull the toes to the nose matters a lot to the plantar fascia, the knee, and other structures upstream- if the leg can’t get past the foot while the foot is fixed on the ground, someone is going to pay the price. The good news is that there are a lot of factors that could be causing your knee pain that in no way signify that you have a bum knee and you’ll never be active again!! Start examining your foot and your hip and if you need help seek out a professional! Targeted treatment goes a long way in preventing real trouble.